Durable and versatile outdoor trousers with Curved Fit with a more articulated waist and extra width over the rear and thighs. 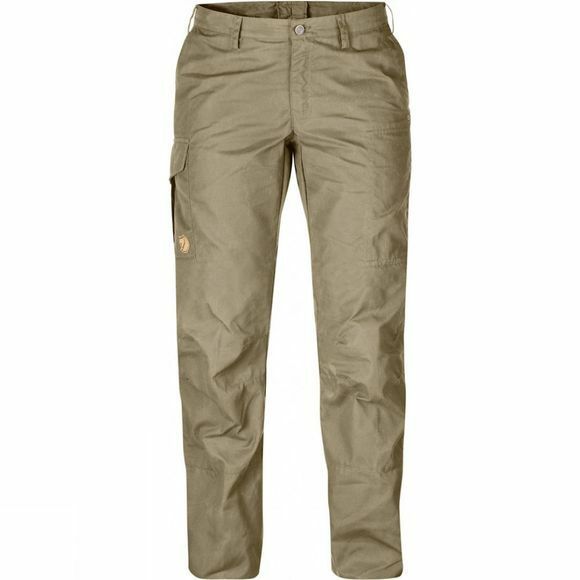 This Pro model of the classic Karla Trousers has a well-worked-through cut to sit better and give more freedom of movement – when you walk, squat and take long strides up on the mountain or in the forest. The material is wind and water resistant G-1000 Silent with a soft brushed finish. The knees and rear are pre-shaped and the waist has a high cut that is a little higher at the back to sit well under a backpack. There are two leg pockets, one with a zip and one with buttons, the latter also has an inside mesh pocket for a mobile phone. There are also two hand pockets and two back pockets with flaps. Raw hems let you easily adjust the leg length to your own height.